Jayson Werth: A Modern-Day Dwight Evans? 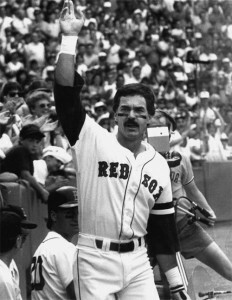 Evans was my favorite player on the old Red Sox teams. He played right field at Fenway better than anyone I’ve ever seen and he had a cannon for an arm. One thing that stands out is how he made pitchers pay for intentionally walking the batter in front of him. I’m sure my memory is fogged by years of cheap beer and John Hughes movies, but it seems like he always hit a homerun in that situation. We will have to get our crack team of Surviving Grady statisticians on that. Previous post Holiday Gift Buying for Red Sox Fans?